Oblique aerial view of Galdenoch Castle, taken from the NW. 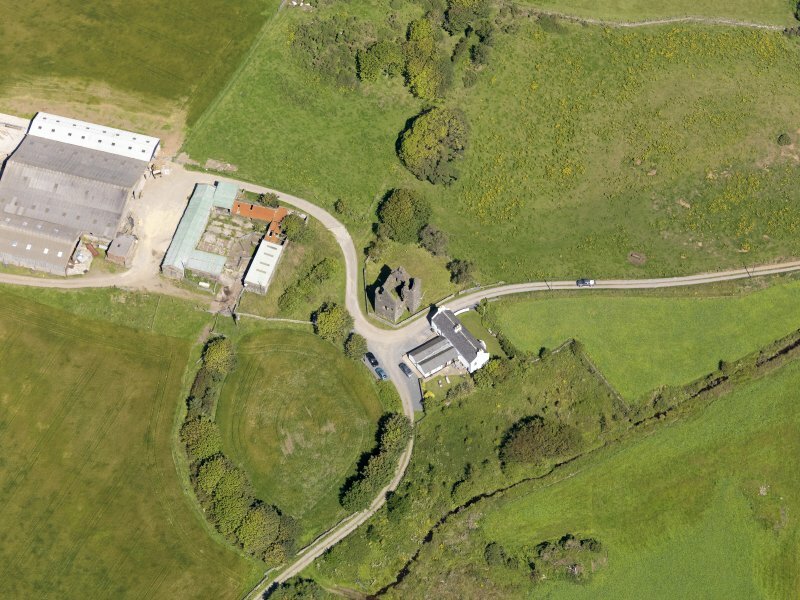 Oblique aerial view of Galdenoch Castle, taken from the WSW. 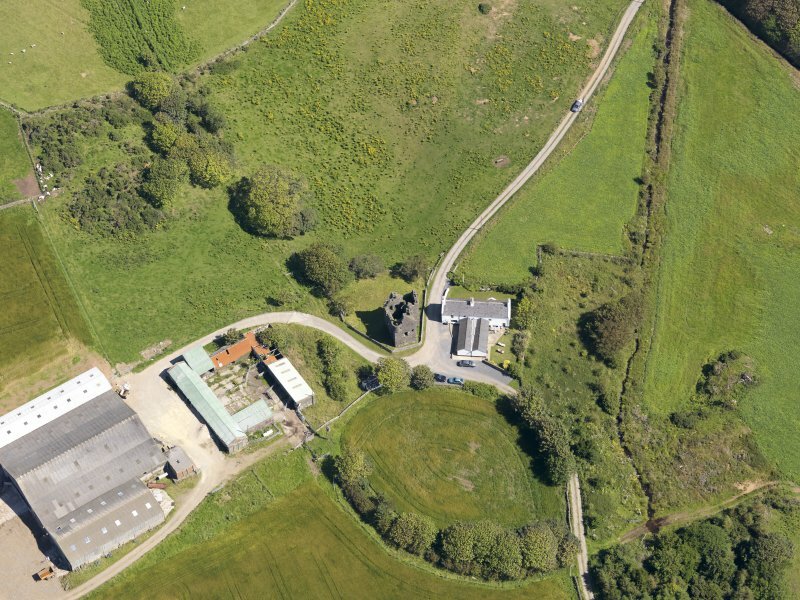 Oblique aerial view of Galdenoch Castle, taken from the SSE. 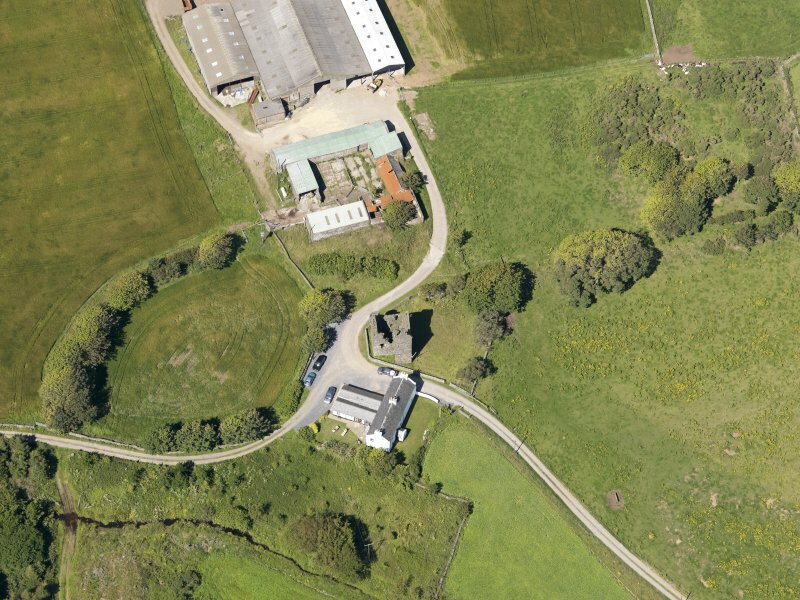 Oblique aerial view of Galdenoch Castle, taken from the SSW. 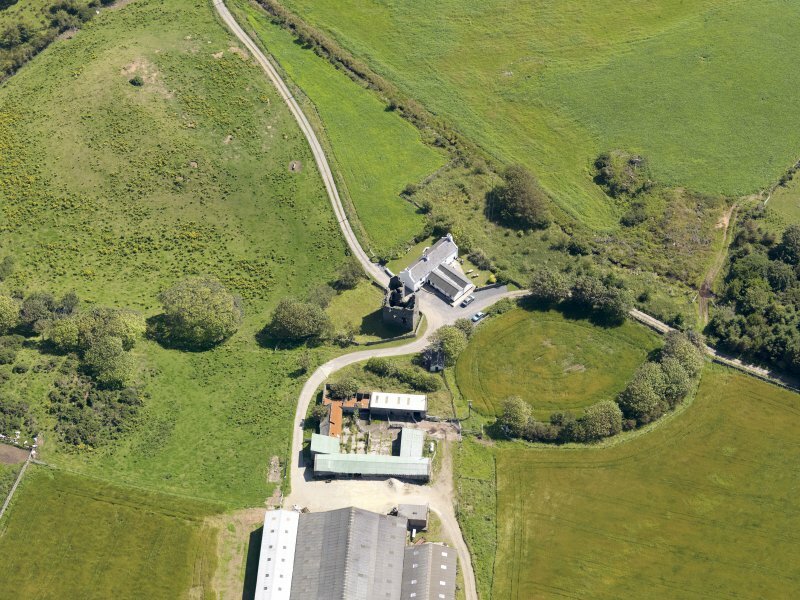 Oblique aerial view of Galdenoch Castle, taken from the ESE. A tower said to have been built between 1547 and 1570. It has been a good example of the L-plan, but is now a ruin, with walls about 3'6" thick measuring to an average height of about 20', though the west wall is broken down to a height of 8' at one point. 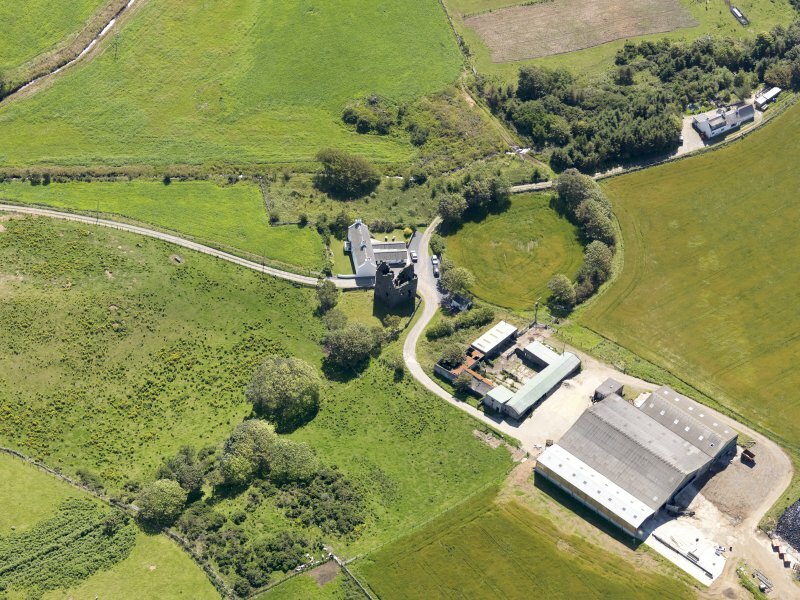 The castle is surrounded by farm buildings and the ground floor is used as a byre. 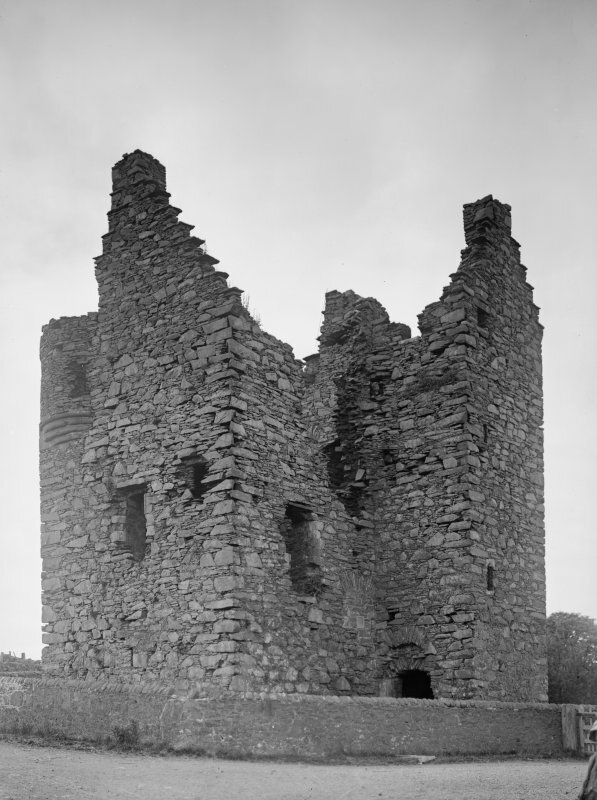 Generally as described by RCAHMS although the castle survives to a height of about 35 feet and the west wall is entire. The east wall bears a plaque with the date 1547. This 16th-century L-plan tower-house, built for Gilbert Agnew of Lochnaw, stands adjacent to Meikle Galdenoch farmhouse. It comprises three principal storeys and a garret, and has a vaulted ground floor (6.95m by 4.4m within walls 1.15m thick) and an entrance in the re-entrant angle. Although access to each floor is provided by a turnpike-stair rising within the wing, a mural stair gives independent access to one of two second-floor chambers. The tower is completed by crow-stepped gables, a corbelled round and a caphouse. D MacGibbon and T Ross 1887-92; A Agnew 1893; W Macfarlane 1906-8; P H M'Kerlie 1906; RCAHMS 1912; RCAHMS 1985, visited June 1984.